Recently, I had the opportunity to interview Dwight Devereaux, “founder emeritus” of TonePros, who is up on what makes guitars sound great and privy to the new and important innovations at TonePros. I also spoke with Gil Vasquez, self-professed guitar geek and TonePros operations manager about the products that maximize a guitar’s sound and performance. Baker: To a guitar player who may have never heard of TonePros, how would you describe what you bring to the player? Devereaux: TonePros products were originally designed to be a “potential maximizer” for guitars. The concept was to find simple and transparent “non-invasive” retrofitting replacement hardware to allow people to get the best possible performance out of the instrument. These improvements generally include improved sustain, tuning and setup stability, increased signal and harmonic response and many others. Baker: What kind of guitars can benefit the most from TonePros hardware? Devereaux: Any guitar fitted with a Tune-o-matic bridge, stop tail piece or Wraparound style hardware, as well as any guitar fitted with Kluson style tuners. Baker: Are the upgrades audible? Devereaux: The results are significantly audible and a tremendous improvement. When your bridge and/or tail are locked into position, it allows for superior intonation adjustment and preserves these all-important settings. When strings are set exactly to scale by precise intonation, the strings will actually create more harmonic overtones and a stronger musical signal. Baker: How did your musical background play into the TonePros company development? Without going into a long resume, I certainly knew what I needed from my instruments, and luckily, I was eventually able to work on creating the improvements and getting these results to the public at large. Baker: What was the toughest obstacle to overcome in building the brand? Devereaux: No, is always the easiest answer for anything new, when you ask to present it to an industry that has had very little change in many decades. 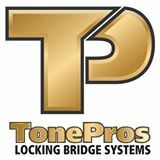 The improvements of TonePros hardware are profound and obvious. Once we got decision-makers to use and evaluate our locking systems on their instruments, the world changed very quickly. Currently, our models are featured as standard equipment on guitars from the boutique builder to world’s largest guitar manufacturers, and our products are distributed and available for retail sale on five continents around the world. Baker: Who are some of your best noted endorsers? Devereaux: Our user group includes many of the most iconic guitarists in history. We regularly supply artists directly, which over the years has included The Rolling Stones, Bob Dylan and even Les Paul before he passed away. Our endorser family of artists appear in our advertisements, and these iconic players include Slash, Rick Nielsen of Cheap Trick, Tommy Shaw of Styx, Peter Frampton, Earl Slick of David Bowie, Dave Mustaine, Warren Haynes and Steve Stevens, to name a few. Really, I could fill the entire page, and I already feel bad that I didn’t mention more of these great players. There’s a better, longer list on the www.tonepros.com website! I will now turn it over to our operations manager, Gil Vasquez. He can certainly give you a more current overview of the TonePros of today. Baker: Gil, how did you get involved with TonePros? Vasquez: I have known Dwight, since he founded the company, when we had Baker Guitars going. We were one of the first companies to use his products as an OEM (original equipment manufacturer) part. I was asked to come on board when Premier Builders Guild and I parted ways, and I have been running day-to-day operations ever since … about four years now. Baker: How have your guitar-building talents helped you with TonePros? 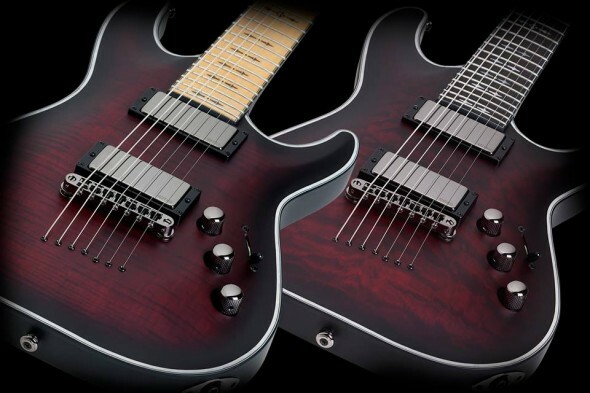 Vasquez: It helps in the fact that having been involved with numerous guitar companies, I can help answer retrofitting questions as well as be involved with design changes as well as new designs. Baker: What is the average day like for a TonePros customer service manager? Vasquez: This can include anything from answering questions on the phone and via email, retrofitting guitars, taking care of OEM customers, as well as keeping things flowing. My official title is operations manager/artist relations. Baker: What companies do you provide hardware to for their standard to custom models? Vasquez: Too many to list here … Some of the notables are Gibson, Fender/Jackson, ESP, Premier Builders Guild (B3, Fano, Koll), Schecter, as well as many others. Baker: Are there any new products being developed that you can share info about? Vasquez: There are new products that will be out for the 2015 NAMM show, but I am sworn to secrecy for the moment. Baker: What do you see as the long-term goal of TonePros? Vasquez: TonePros has come a long way since the beginning and is now a global brand name. We are looking to branch out into more countries as well as work on new products for guitar and bass. Baker: Where can musicians purchase TonePros hardware? Vasquez: You can now purchase online through our website, and the nearest store that has the part in stock will ship it to you. Baker: How hard is it to install TonePros hardware? Vasquez: Retrofitting a guitar with our hardware is a very simple. In most cases, it just involves removing your old bridge, tail and studs and replacing them with ours. Baker: Will these upgrades require modifications that will alter my guitar or its value? Vasquez: No, if anything it may increase the value. On vintage guitars with vintage hardware, we always suggest you keep the old parts and set them aside in the case that you do sell a guitar, so the value stays. Baker: Has the company’s evolution from start up to today changed much from the original vision? Vasquez: The vision has always been to manufacture high-quality components at an affordable price, while improving the overall tone and sustain of the guitar. That’s what our products are and do, so I would say not really. We have not had a price increase, since we started. Baker: So what are you listening to today? Vasquez: The new Slash studio album with Myles Kennedy and the Conspirators — can’t get enough of it — and Tesla’s new one, “Simplicity,” is also plugged in. Baker: Anything you would like to say to a potential TonePros customer? Vasquez: Once you try our products on one of your guitars, you will want to retrofit the rest. The reason more and more artists and guitar companies use our components is because they work. Put TonePros on your guitar today and hear and feel the difference.